Finding just the right appetizers when you are hosting a holiday party or having everyone over for a holiday meal can always seem like a challenge. You want to go beyond just having cheese and crackers or chips and dip and want to put out something memorable that makes a great snack before the main entrée or a fantastic addition to a buffet table. One of my favorites is to always do something different with meatballs. You can do so many different things with meatballs and a great sauce and then all you need is a platter and some toothpicks and you have the perfect finger food. 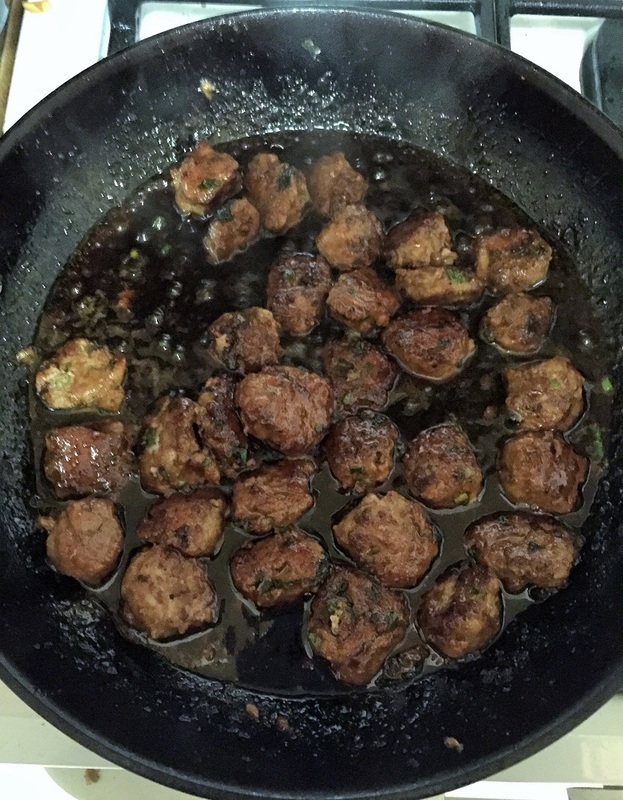 I came across this recipe recently from the New York Times and decided to try out the recipe for scallion meatballs with a soy-ginger glaze. I initially made a batch and we had some for dinner that night and I froze the rest to have on hand for appetizers at a later date. They are easy to make, make great use of turkey and the glaze is out of this world. To make the sauce, bring the brown sugar and 1/2 cup of water to a boil in a saucepan set over medium-high heat, stirring the mixture until the sugar melts completely. Reduce the heat to medium-low and add the soy sauce, mirin, chopped ginger, coriander and the peppercorns. Simmer, stirring the sauce occasionally, until the sauce has been reduced by about half, about 30 minutes. Strain the sauce through a sieve to remove the solids and discard the solids. To make the meatballs, mix the ground turkey, scallions, cilantro, beaten egg, sesame oil and the soy sauce and several grinds of black pepper in a bowl. Roll tablespoons of the mixture together into balls. in a skillet set over medium-high heat, generously coat the bottom of the pan with vegetable oil. Working in batches to avoid crowding the pan, place the meatballs in the pan and cook, turning, until the meatballs are browned all over and cooked through inside, about 8 minutes per batch. Arrange the meatballs on a heated platter and spoon a little sauce over each meatball and serve the meatballs with toothpicks. If desired, keep the meatballs in the sauce warm in a 200 degree oven until you are ready to serve. The meatballs themselves are very tasty with the scallions adding a nice layer of flavor to them, but the sauce is the real winner in this dish. The ginger, soy sauce and mirin really stand out to make the sauce sweet and a little sticky and packed with flavor. I could see using this sauce over a variety of other items, such as a pork tenderloin or pork chops or even chicken pieces or boneless chicken breasts. The meatballs are a perfect appetizer for any type of party and you can make them and keep them warm until you are ready for the party.